Home / Drama / Essays. / G.B. 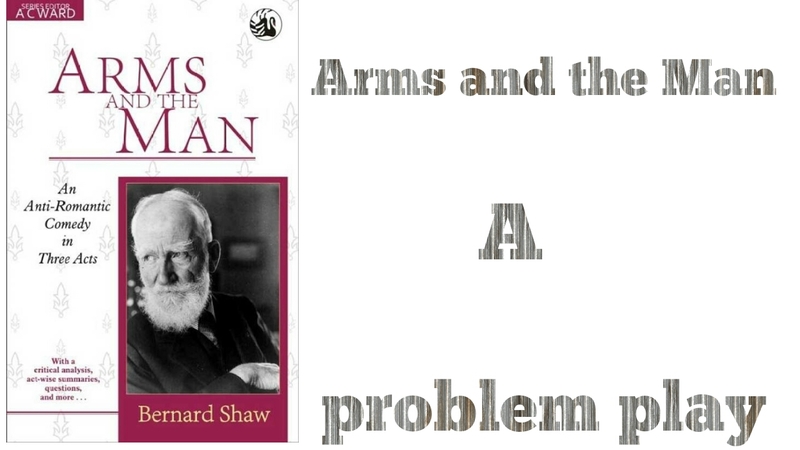 Shaw / Honours 2nd Year / "Arms and The Man" as a Satire. "Arms and The Man" as a Satire. Satire is a form of literature which exhibits vice and folly and makes them appear ridiculous or contemptible. Long defines satire as “a literary work which searches out the faults of men or institutions in order to hold them up to ridicule.” According to Dryden, “the true end of satire is the amendment of vices by correction.” In Arms and the Nan Shaw has satirised the romantic ideals of love and war, soldiering and the social snobbery. His aim is to bring about a correct understanding of the nature of love and war. Shaw satirises conventional romantic notions about war and soldiering through his mouthpiece, Bluntschli. He attacks the romantic lies about war and soldiers by categorising the soldiers into young and old ones. According to Bluntschli the old experienced soldiers carry some food inside their leather cases and cartridge boxes instead of weapons and gun-powder because they have learnt from their experience that food will save their life in the battle field. The young inexperienced soldier, on the other hand, carry arms with them because they consider war as a romantic affair. They lack practical experience of war. Thus Shaw ridicules the whole business of fighting. Shaw satirises the supposed heroism of soldiers through the cavalry charge against a battery of machine guns. Bluntschli exposes the foolishness of Sergius by telling Raina that Sergius tries to show bravery in the cavalry charge without knowing the fact that if the Serbians had the right kind of ammunition, the Bulgarians could be massacred. He further tells her that “nine soldiers out of ten are born fools.” This view is soon proved to be true when the Russian officer fails to notice Bluntschli’s pistol lying on the ottoman staring in his face all the time. Through Bluntschli, Shaw also shows that soldiers are afraid to die. They prefer life to death. Shaw satirises the ideals of romantic love in the play through the characters of Raina and Sergius. They are two apostles of ‘higher love’. Raina addresses him as her ‘king’ and he addresses her as his ‘queen’. But such an apostle of ‘higher love’ begins to flirt with the maid-servant, Louka, as soon as Raina goes out of his sight. And for Raina when she sees Sergius flirting with Louka, her ilusion about him begins to crumble down. She, then is being drawn to unromantic Bluntschli. When Catherine warns her that Sergius will break off the engagement if he comes to know about the Swiss officer’s midnight adventure in her bedroom, Raina scolds her mother by saying, “I sometimes wish you could marry him instead of me. You would just suit him. You would pet him, and spoil him, and mother him to perfection.” Nothing can bring out better the hollowness of romantic love then this remark. Shaw also ridicules the romantic attitude and poses of Raina and Sergius. Sergius is not a chivalrous knight. He acts like a fool in leading the cavalry charge against the artillery. He is proud of his victory at the battle of Slivnitza but actually he is an stupid. He strikes poses and so is easily befooled and entrapped into msrriage by a mere maid-servant. Raina is also like Sergius. She tells lies and strikes poses. She says that her romantic ideas have been derived from her reading Byron and Pushkin and seeing operas at Bucharest. Bluntschli sees through her and laughs at her poses and lies. Marriage is also a target of satire in Arms and the Man. Shaw satirises marriage between two people of same status with highre spiritual values. Shaw mocks romantic notion of love which glorifies womanhood. According to Shaw a woman must marty a man of superior intelligence to beget a better race of men. Thus Raina marries Bluntschli because he is likely to prove a better father than Sergius for her children. Similarly Louka marries Sergius because he is superior to Nicola. Shaw also shows that marriage should be based on economic security and mutual understanding instead of romantic illusions. Raina marries Bluntschli because he is richer than Sergius, Louka marries Sergius because she finds in him more economic security than in Nicola. Shaw also ridicules the social snobbery. He has severely attacked the snobbery of Nicola and the Petkoffs. Nicola’s snobbery is found in his acceptance of the superiority of his employers. The Petkoffs are proud of their library, their staircases, and their electric bell. Raina thinks that the Petkiff is the richest and best known family in Bulgaria. She takes pride in seeing opera at Bucharest. Her mother wears tea-gown on all occasions to imitate Viennese lady. They pose to be cultured and advanced but actually they are very backward. Thus in Arms and the Man Shaw satirises romantic conceptions about love and war, marriage, social inequality and snobbery.